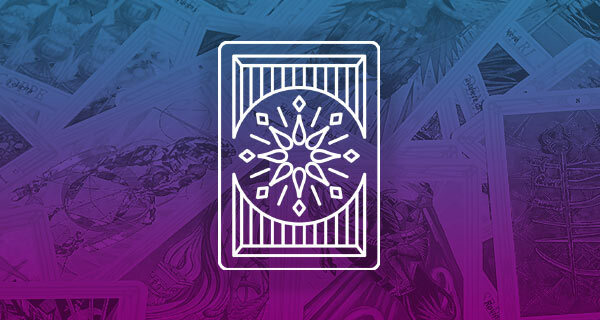 Just in time for Halloween, your weekly tarot reading explores a relatively new book called “Magic Tarot – A Journey of Self-Realization,” by Magick Altman. 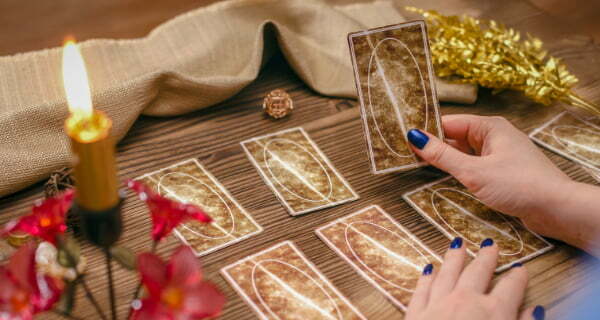 I have actually met Magick and have experienced her readings firsthand, so I can attest to her amazing knowledge of the cards, of numerology, and the Kabbalah as well. 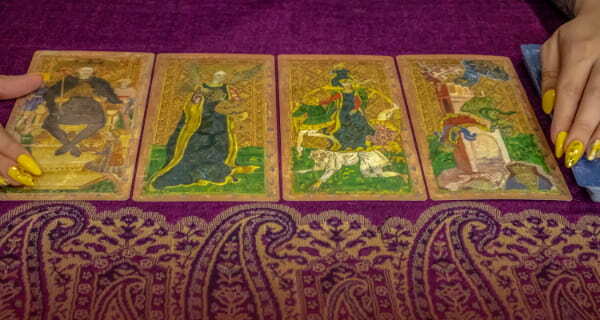 Magick also weaves some astrology, mythology, and Jungian Archetypes into her readings. 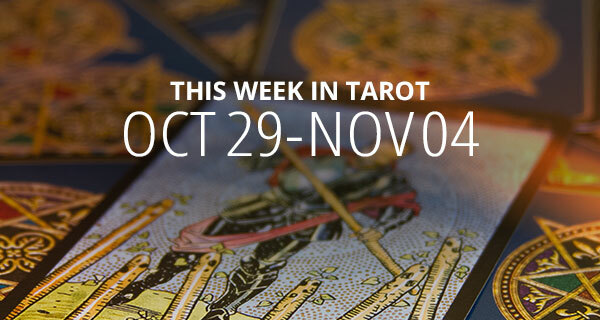 She is definitely my kind of reader and I’m sharing her interpretations with you in your weekly tarot reading! DAY (THE PRINCESS OF WANDS): This is the first card of your weekly tarot reading and it indicates that the spirit of youth is calling you to action. Therefore, it’s not a time to shy away from letting people see your true self. This Princess lets you know that you are beautiful and have the most charisma when you are unabashedly yourself. She invites you to enjoy being in your body and glowing from within. So, try wearing bright and fiery colors and saying those things you tend to stifle for fear of what others will think. The Princess is here to let you know that it’s in your power to shine. EVENING (The FOOL): Crowley called the Fool, “the Babe in the Egg of Blue, neither man nor woman, but both in one.” Magick explains that the Fool is still in the Cosmic Egg, pointing to the awareness of the potentiality of life. The Fool reminds you that everything is possible right now. There are no limitations, only dreams, and imagination. He is simply glad to be alive! Tonight, the Fool calls to you, encouraging you to come out of your cave of worry and introspection and drink in the moment. He also reminds you that life always offers the opportunity to start. The Fool can also bring you experiences in which you discover hidden aspects of yourself that can awaken your more creative and playful sides. DAY (PRINCE OF SWORDS REVERSED): Today, this Prince appears in your weekly tarot reading to help you make some sound choices that will take you deeper into your personal evolution. It’s time to reign in the ego’s desire to be the smartest, and instead, take time to discover your deepest yearnings within. A good place to start is to ask, “What do I love to do?” Don’t look for what you would love to do for a living; just look for what you love doing. If the answer doesn’t come easily, then ask yourself what you loved doing as a child. This exercise will help you reclaim the playful child. Reversed, this Prince may jump from fad to fad, or guru to guru, or relationship to relationship, without engaging emotionally. EVENING (TEN OF SWORDS REVERSED): In the Thoth image, we see 10 swords pointed inward and therefore ineffectual. The sword in the center with a broken heart symbolizes the mind’s inability to listen and act from love. Thought gets caught up in a web of fear. The mind obsessively pursues a plan, an answer or anything that will fix the situation. However, nothing positive arises from fear. There is a feeling that nothing will work, nothing can help, and desperation, isolation, and madness ensue. Tthe reality is that isolation and preoccupation of the mind block the way through a difficult time. The reversed meaning implies that no matter what you do, there is no way out. This is not true, but only if you allow a positive shift to happen. DAY (THE CHARIOT): The Chariot is the first card in this weekly tarot reading that is an object. The charioteer sits or stands in the chariot, but your attention is on the chariot itself. The Chariot calls you to examine your real focus and purpose. Are you trying to win or conquer to prove something to yourself or others, or are you on a journey of self-development? Are you sacrificing the feelings of others to elevate yourself? What vehicle will take you to the next level of understanding? Today is the perfect day to choose which path you will take. EVENING (KNIGHT OF CUPS): He’s the knight in shining armor. He has wings, like an angel and dresses like a warrior. In the realm of relationships, the Knight represents an offering of love. He is loquacious, eloquent, charming, and erudite. He cares about his appearance, has exquisite taste, has an easy way about him and a quick wit. The Knight is a graceful conversationalist too. Have you recently met someone just like him? If you have, find out more about him before you let yourself be swept off your feet. DAY (SIX OF CUPS): With the Six of Cups, now it’s time to soar higher than before. The more you’re willing to shed light on problems and not give in to your fears, the more you can experience the joy of lasting relationships. If you’re not in a relationship, it means you have looked closely at your history and now know how to enter into love with your eyes open. Within your family, it’s time to forego problems and enjoy the love that underlies these lifelong bonds. In terms of work, try to be more kind and cooperative with your coworkers by bringing empathy to the environment. It’s a time to listen and reflect so that you can mirror the best of what others offer. EVENING (SEVEN OF CUPS): When you do not love yourself, other people and, in fact, the entire world, you become a resource for recklessness and selfish desires. This is a good time to learn how to stay in your power while creating safe and conscious ways to enjoy your amazing body. What you need is hidden in your heart. Therefore, it’s time to explore ways to love yourself and find healthy forms of self-expression. DAY (EIGHT OF SWORDS): As with the Seven of Swords, this card reveals mental chaos in the background. Two large swords are pointed downwards, suggesting they are ineffectual. There are six other swords trapped behind them. There is a total lack of clarity and focus, but ironically, life feels full and rife with options. That’s because the mind is divided and possibilities come to the fore and then recede. Right now, you are very vulnerable to these influences that are in your mind, as well as those manifesting in schemes from external forms. It’s time to regroup. Try to reestablish a schedule that prioritizes what is important in your life, including special time for yourself. EVENING (EIGHT OF CUPS): The leaden skies of Saturn weigh heavily over the Piscean sea. You could pray for rain, thunder or a cloudburst to relieve the quiet brooding. Or, you could just hope the dark clouds move on. But nothing has changed for a while, and the longer this goes on, the lonelier you’ll feel. If you are in a relationship, this card indicates comfortable stagnation, where nobody wants to rock the boat. Yet, both parties know something isn’t right. However, Saturn is not going to let up until something changes. It’s time to take a holiday, do some therapy, or have some mystery dates to spark the passion once again. DAY (FORTUNE/THE WHEEL OF FORTUNE X): The goddess, Fortuna, never stops spinning out new variations on the themes of life. She dazzles us with an enthusiastic presentation of these exciting opportunities, offering us the golden ring on the merry-go-round of life. Fortune’s number is 10, so it’s definitely the end of a cycle in your life, especially in the arena of career. Note your accomplishments as well as the limitations you were dealing with. Then ground yourself in a clear assessment of what possibilities would offer you ways to grow, expand your realm of influence, and bring more abundance into your life. Sitting in the seat of calm (at the center of the Wheel) provides you with a non-reactive awareness of other people and circumstances surrounding you so you can see the light that will guide you forward. EVENING (TEN OF WANDS): Saturn has thwarted every attempt by Sagittarius to change your situation and the attitudes of the people involved. The structure itself must be changed so it’s time to revamp, retreat, be patient or leave. This card is called Oppression and shows eight wands that were active in the past trapped behind two large wands that look like the bars of a prison cell. A wall is blocking progress but confident Sagittarius refuses to step back. Often, when there is a blockage, the path of least resistance is the way to go. Perhaps it’s time to step back in order to see the full spectrum of options. When nothing is working, doing nothing may be the answer. Regroup and release to clearly see the situation at hand. A way through may arise from within. DAY (KNIGHT OF WANDS): This brave Knight rises out of the mysterious waters of Scorpio, leaping into the fierce fires of Sagittarius, confident, inspired, and determined. His dark horse tries to hold a steady path, possessing the deep, transformational wisdom of Scorpio, but this fiery Knight is determined to take a daring leap into the outer worlds as well. This may be exactly what you need if you tend to always overthink things and never take any risks. On the other hand, if you tend to be prideful and impulsive and have, therefore, become unstable and unpredictable, it may be time to think twice and try to prepare for some possible outcomes instead of just putting the blinders on. EVENING (TWO OF WANDS): As the last card of your weekly tarot reading, the Two of Wands presents the image of a Tibetan Dorje and it is called Dominion. In Tibetan teachings, thunder sends our egos scurrying for shelter from the awesome powers of nature. However, it’s in these moments of awe that we are able to release the insignificant limitations of ego, fears, and reconsider where our true place is in life and in the world. This card is an awakening, an epiphany, that sends a shockwave through the false structures that hold you back from opportunities to reinvent yourself.